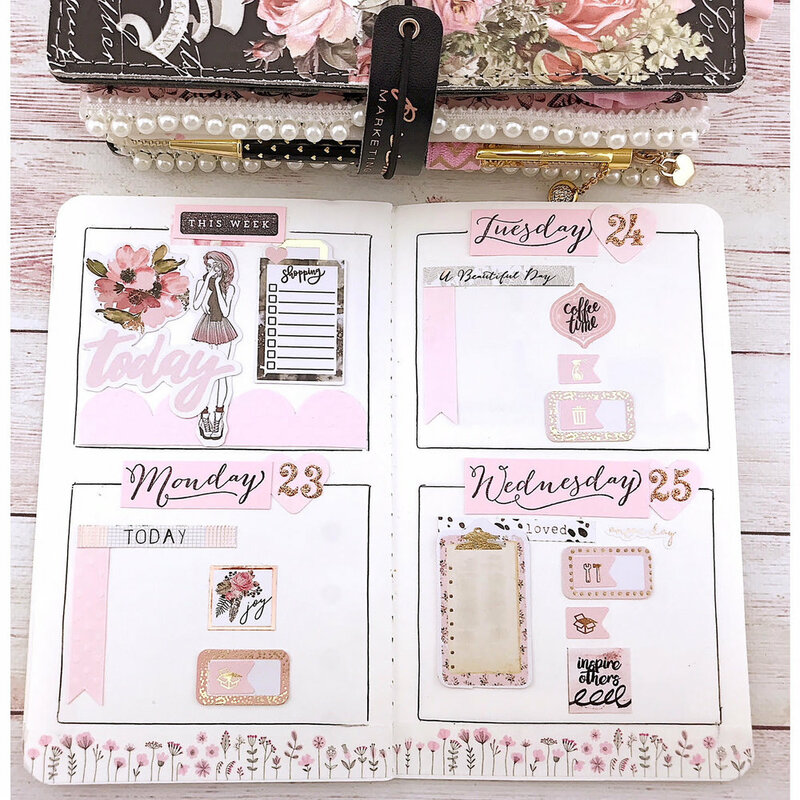 Make your own weekly inserts with a free template that will fit any My Prima Planner Personal Faux Leather TJ’s range (Sophie, Vintage Floral and Gemini) and inserts. More templates to come in the future that will fit My Prima Planner Standard, Personal Leather and Passport sized Travelers Journals. The templates are designed to be used with the My Prima Planner stamp set “These Days” (#599997). You can make vertical or horizontal boxes for your weekly planning with the templates. Come join Wendy as she shares with us an insert templete she made to use in her Prima Travelers Journal that she is sharing with all of you so you can use them too! 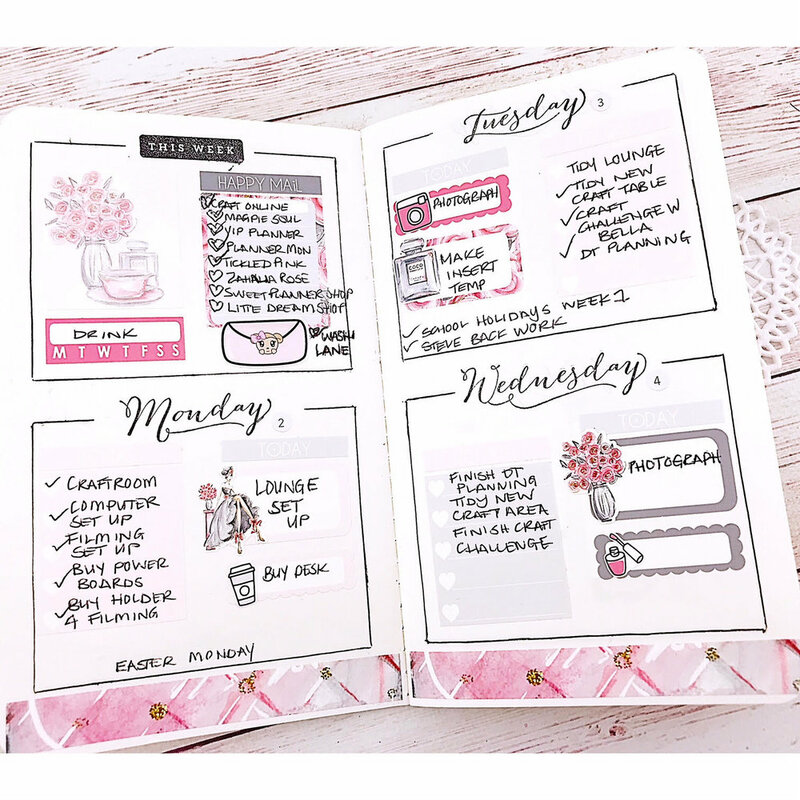 Wendy, "When I do my weekly planning I love to have an Erin Condren style box to plan in as I find my planner looks neater and that makes my head happy plus I get to use all those Etsy sticker kits. I wanted to use the Vintage Floral TJ and matching inserts to do my weekly planning but I couldn’t because Prima don’t make weekly inserts in this size and you can’t buy them either from any store because they’re not any usual TN size (going by the size of the inserts that Prima make for the Faux Leather Personal). So I decided to make my own weekly inserts. I like to have 1 week on 4 pages. So I made a box I could trace to give me 1 notes section followed by one box per day (total of 8 boxes in one week)." Then I decided I really wanted to use the ‘These Days’ stamp set so changed the template boxes to allow you to stamp in the blank area. Bellow you can see how Wendy cut out her templete and began tracing it to make her insert. Below you will find the link to download the free templete Wendy created for all of our Prima fans. Print out template from link. Glue onto cardstock and cut out. Each template, both vertical and horizontal, is designed to fit over 4 pages to have enough boxes for 1 week plus a spare box. Each page has 2 boxes on it. Place the spacer on the bottom of your page. Place box on top of spacer and trace around box avoiding the “x” with your fave pen. The “x” part is for you to stamp in later. Move template over and repeat. Keep repeating until you have filled 4 pages with 8 boxes. Only with the vertical template - in your first box, don’t trace the top so you can use the header stamps. Bellow you can see the templete being used in a horizontal layout. The most import part is to have fun and create an insert that works best for you in your Prima Travelers journals. So have fun and don't forget to say thank you to Wendy over @prettymintplanner for all her hard work and dedication in inspiriting you Prima fans how to use your travelers journals.